It is a long-lasting partnership. In fact, INFOLOGIC has been supporting, for several years the « Bio in the Stars » event, organized by the Nature Vivante foundation, which will take place on Friday, the 17th of April 2015 in Annonay. Fill up with trainings for 2015 ! The new year is almost here and brings the forecast for your training plans for 2015 with it! The training budgets are allocated on the calendar year. Think already of the training of your partners on COPILOTE. 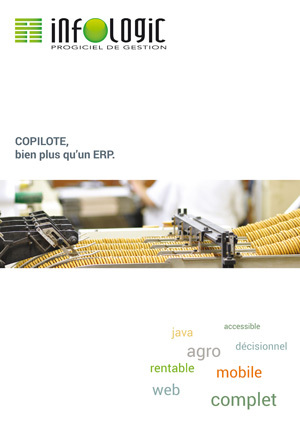 The specialist of management software programs of the food supply chain, Infologic, presents its new application Mobilogic, mobile version of the sales modules of the enterprise resource planning (ERP) COPILOTE. Created in 1982 by André Chabert, INFOLOGIC is a company that creates and integrates software solutions for the food supply chain. Our edition teams develop the functionalities of COPILOTE, ERP solution dedicated to the food supply chain, as well as data acquisition tools based on tablet or Smartphone. Our integration teams implement the ERP COPILOTE to several industrial companies and traders of the food supply chain, all over France and Europe. INFOLOGIC optimizes the use of COPILOTE thanks to several services : customizable hardware architecture, hosting, EDI, web applications… Confide your project to us and develop your activity!